Professor Miguel Yacaman has watched microscopes evolve all his life. “Changed” is perhaps an understatement. On Jan. 19, Yacaman watched as two 18-wheelers delivered the world’s most powerful microscope to UTSA. Dubbed “Helenita” for Helen Kleberg Groves of the Robert J. Kleberg, Jr. and Helen C. Kleberg Foundation, which gave $1.2 million toward its purchase, UTSA’s new JEM-ARM 200F is causing quite a stir. The microscope (shown at left), which sits at 9 feet, 2 inches tall and weighs more than 2 tons, is being installed in UTSA’s Advanced Microscopy Laboratory. The machine allows scientists to see samples with a resolution of 0.8 angstroms, at a magnification 20 million times the size of a sample. To put it in perspective, a strand of human hair magnified 20 million times would be the size of San Antonio, says Yacaman. With such incredible detail at their fingertips, nanotechnology researchers are eager to develop new therapies and treatments to combat a variety of human diseases. “We now have access to resolutions that will give us a tremendous scientific advantage to solve problems that need to be attacked. We’ll be able to watch particles behave one atom at a time. This is the Holy Grail for us,” says Yacaman. Yacaman’s own laboratory is targeting nanoparticles for cancer treatment. One method they are investigating is placing nanoparticles inside a tumor and using an infrared laser to pinpoint and burn away damaged cells without harming the surrounding healthy cells. But more research is needed. “We need to see the particles atom by atom. We need to know exactly how they behave. Helenita is the only microscope that will allow us to do that,” Yacaman says. Yacaman has been contacted by a long list of industry researchers waiting to access Helenita’s crystal-clear resolution. Although UTSA researchers will be the first to use the microscope, Dave Olmos, the facilities manager at UTSA’s Advanced Microscopy Laboratory, expects the microscope will be operating 24 hours a day, seven days a week. Eventually, UTSA will offer remote operation through the Internet to scientists around the world, giving them access to a multimillion dollar piece of equipment for the cost of a $30,000 set of controls. “They’d send us their sample, a UTSA laboratory technician would place it in the scope and the researcher would remotely operate the scope on their computer,” Olmos says. Because sound vibrations, magnetic field vibrations and temperature fluctuations of more than half a degree can skew the instrument’s results, significant preparations were needed to ensure Helenita has a properly outfitted home. 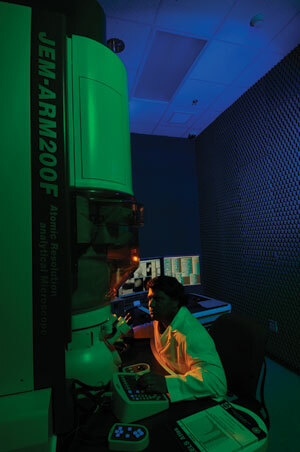 The ARM200 is the fourth UTSA microscope to be funded by the Kleberg Foundation and the seventh addition to the university’s Advanced Microscopy Laboratory. While women still struggle to achieve parity with men in math and the sciences, three UTSA alumnae who earned doctorates are blazing trails for other young women, encouraging them to take the road less traveled. Developing a breakthrough technology or scientific process is a lot different than getting the discovery into the marketplace. That's why UTSA is adding infrastructure and staff to promote commercialization of university-sponsored research. Math and science majors can earn their degrees and teacher certification at the same time through the GE2MS program, designed to meet the critical shortage of math and science teachers. New microscope enables researchers to watch chemical reactions one atom at a time. Researchers and faculty are advancing scientific knowledge on a variety of fronts. Scientists, faculty and students in a variety of fields have garnered awards, grants, scholarships and honors for career contributions, ongoing research and study. Catalyst is a publication of the College of Sciences at The University of Texas at San Antonio. Catalyst is created for faculty, students, alumni and friends of the college and highlights achievements in research, scholarship and community outreach.